Guilded Age » The Latest Adventure of Gort & Robby! I don’t recognize the jedi-Frankenstein’s monster robot. 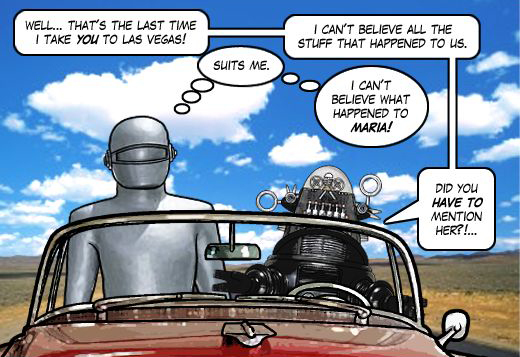 Those are Gort (from The Day the Earth Stood Still) and Robby (from Forbidden Planet). Which one is your “jedi-Frankenstein’s monster robot”? Neither one says Jedi to me in any way. I know both of these as they are both from my dad’s favorite films…now if somehow “The Enemy Below” makes a cameo, and this’ll be…well…it’ll be stuff I know via my father. Did you not click on the picture? It’s a link to the comic. The image here is just the first panel of the comic. The one in the ‘jedi-robes- is The Colossus of New York and since he has a human brain, and Maria was brought to life with a human’s brainwave patterns, it…kinda makes sense. I’d love to see that conversation.